PHOTO BY JACOB GURNEY Rescue personnel assess the scene of a fatal accident at CR 50 and CR 15 Wednesday afternoon. A Republic man was killed in an accident at CR 50 and CR 15 Saturday afternoon. Robert W. Schultz, 65, of Republic, was driving a 1995 Chevrolet southwest on CR 50, according to a release from Seneca County Sheriff’s Office. The release said Arthur L. Johnson, 43, of Grove City, was driving a 2014 Freightliner semi south on TR 15 and approached CR 50. 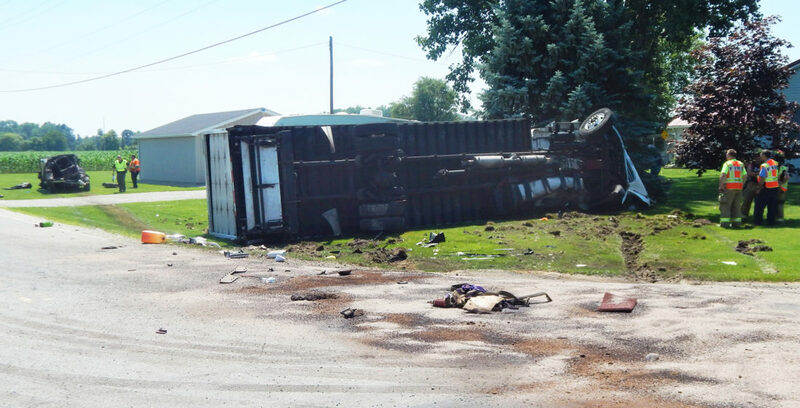 According to the release, the Freightliner entered the intersection into the path of the Chevrolet, causing both vehicles to go into a yard at the southwest corner of the intersection. The Freightliner overturned onto its driver’s side and the Chevrolet came to rest on its wheels a short distance off of CR 15, the release states. Schultz was pronounced dead at the scene and was transported from the scene by Seneca County Coroner’s Office, the release states. Johnson and his passenger, Myles A. McNeal, 20, of Westerville, were transported to Mercy Health – Tiffin Hospital by Tiffin Fire Rescue Division to be treated for non-life-threatening injuries, according to the Sheriff’s Office. Charges are pending the outcome of the investigation, the release states. Emergency Management Technician Michael Klaiss said the semi’s fuel tank was ruptured and diesel fuel spilled on the road and in the yard. He said it was likely a contractor would be needed to excavate the soil and replace it. Oil-Dri was used to clean up the spill in the road, he said. The accident was reported at 1:13 p.m. and Tiffin Fire Rescue Division, Clinton Township Volunteer Fire Department, Seneca County Sheriff’s Office, Seneca County Emergency Management Agency, Seneca County Engineer’s Office, Seneca County Prosecutor’s Office, State Highway Patrol and John’s Welding and Towing responded to the scene.